We check out of the Country Bumpkins and move 20 miles away to the Twin Rivers Campground, Cottages and RV Park in Bath. It’s a nice park, with full hook-ups and great WIFI. 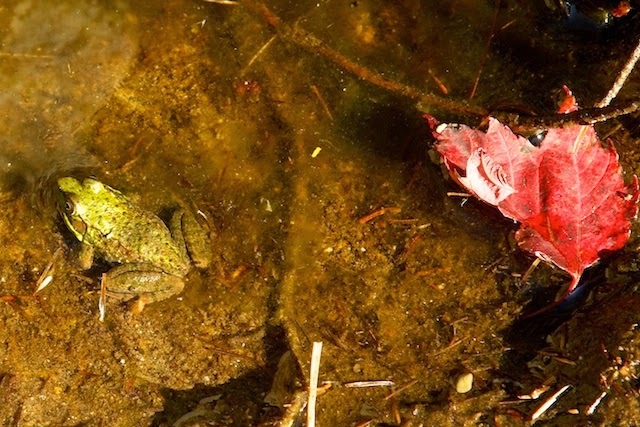 They also have access to over a mile of the Wild Ammonoosuc River a well-known spot to pan for gold. Their campground store also stocks all the equipment and prospecting supplies to strike it rich. 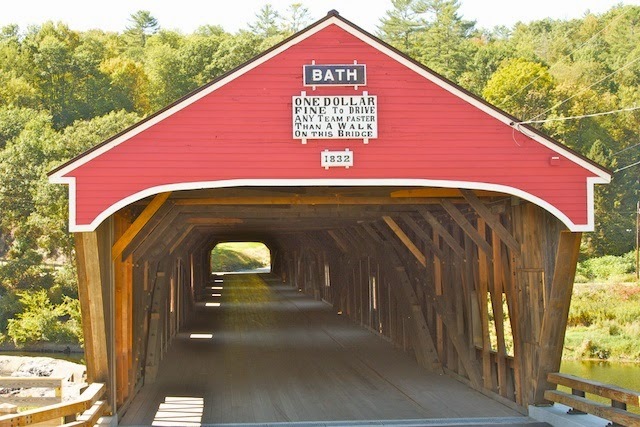 The Bath-Haverhill Bridge constructed in 1829 is the oldest covered bridge in New Hampshire. It was in continuous use until 1999 when it was closed to vehicular traffic but foot traffic is still allowed. The Bath Bridge built in 1832 is still open to vehicular traffic. A three million dollar 22-month renovation was just completed in August of 2014. From the exterior the bridge looks brand new, but much of the original structure is visible from inside the bridge. The Swiftwater Bridge erected in 1849 is open to vehicles with a 6,000 lb. limit. 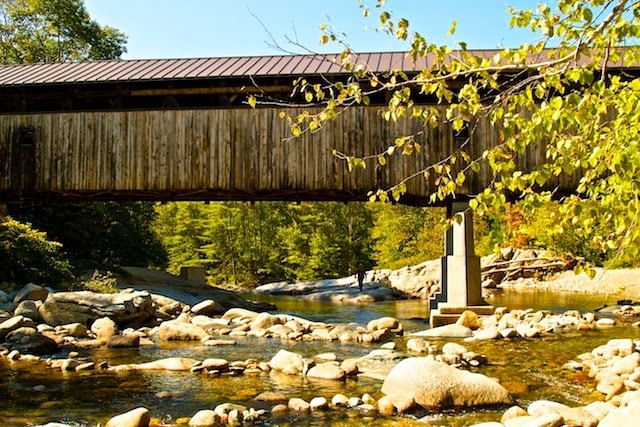 It is located along a section of the Wild Ammonoosuc River that was used to float logs to a sawmill. Occasionally logjams would endanger the bridge. 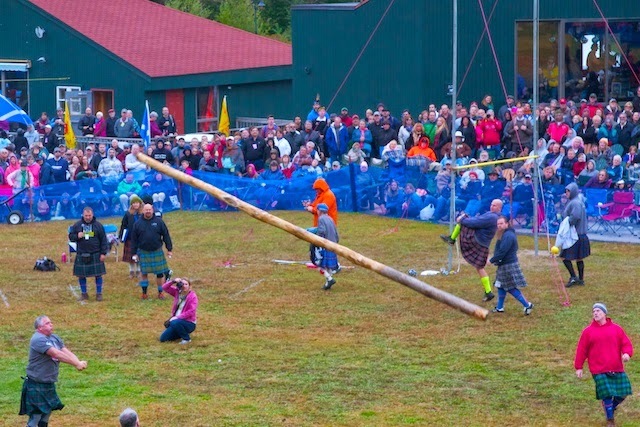 Once someone had the bright idea to break up the logjam with dynamite. The blast was successful. However, logs had to be removed from the roof of the bridge. 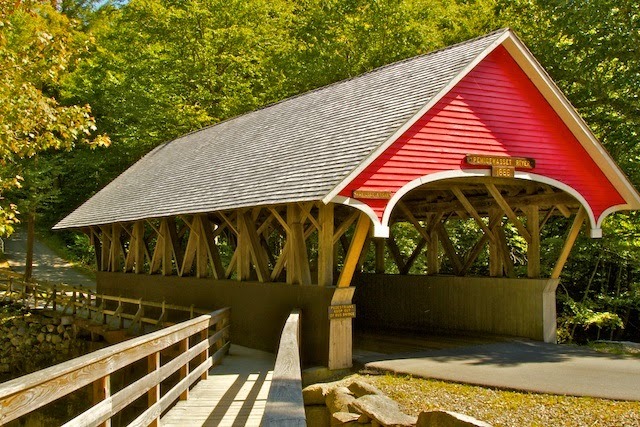 Just around the corner from the Bath Covered Bridge, TheBath Village Center is the social and economic heart of the town. 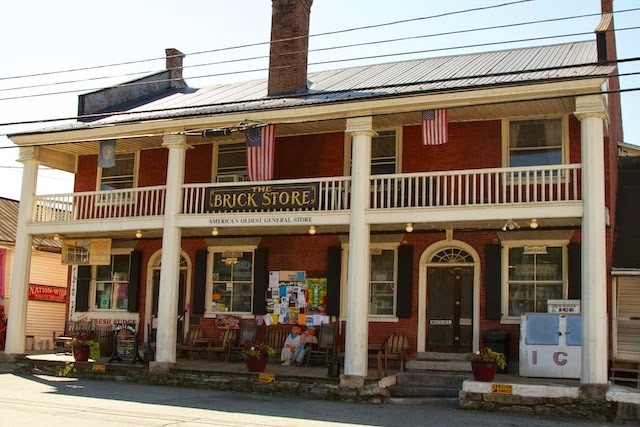 We stop by The Brick Store: Considered America’s oldest continually operating general store dating back to 1790. Here we meet owner Mike Lusby an East Bay (San Francisco Bay Area) transplant and New Hampshire resident for over 20 years. Although the store carries the assorted sundries found in most general stores, their specialties are smoked meats and cheese done up in a smoker in the alley next to the building by Mike’s brother Jim and 140 different flavors of fudge created by Mike’s wife Nancy. After trying the free samples of their goodies we leave with some zesty smoked pepperoni and cheddar cheese. We made homemade pizza with the smoked pepperoni & cheese and it was so mouth watering, we had to return before leaving New Hampshire to pick up more. We’ll have to mail order from them when we run out again. Next to the Brick Store is At The Hop a 50’s style ice cream parlor and gift shop also owned by Mike. 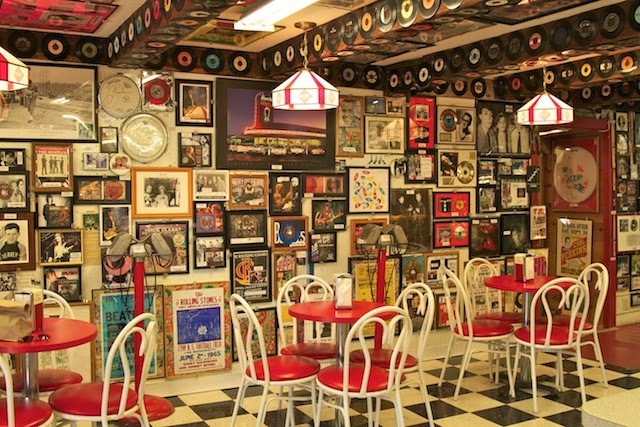 The shoppe sports a huge collection of rock and roll memorabilia, (most of it autographed and addressed to Mike) that covers almost every surface of the parlor, (only the black and white checkerboard floor is exempt.) We are examining the musical miscellanea, (much of it is personally autographed “to Mike”) when Mike comes into the shop and tells us a bit about how the collection started during his tenure an almost-made-it rocker in the 60’s and 70’s and continues during his current musical avocation as drummer for The Rocking Chairs since 2004. We journey onto the next shop along the commons: The American Heritage Gallery of Art where artist Craig Pursley operates a Studio and gallery. 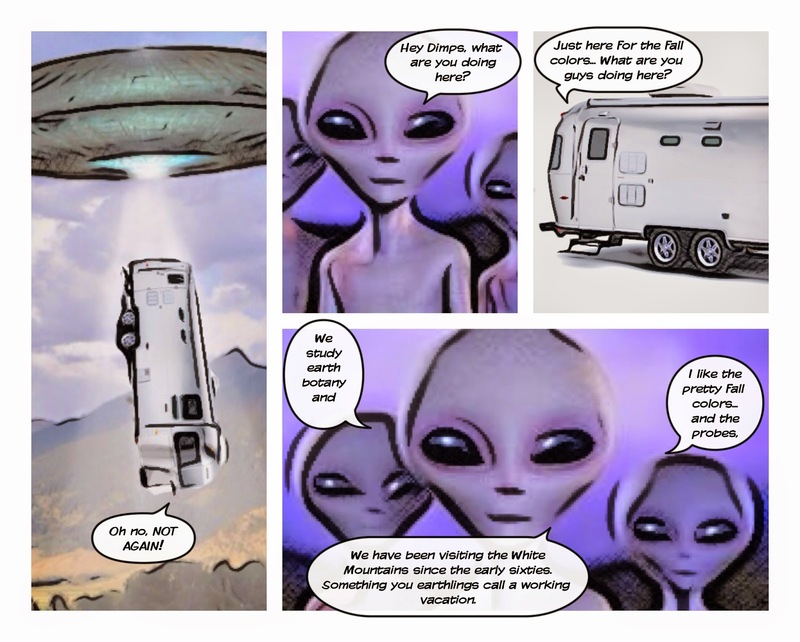 When we enter through the front door, Mike is here telling Craig about a couple from California who sold everything and travel around in an Airstream. (We didn’t realize that there was a side door into the gallery from the ice cream parlor.) Mike owns this building too, which completes his trifecta of Bath Village businesses. We enjoy chatting with both Craig and Mike about their experiences as California transplants in New England. They both expressed that the folks in New Hampshire were warm and welcoming when they first arrived and feel that they are part of a community with the caveat that they will always be “from away.” Craig told us about a funeral he recently attended for a 95-year-old man who moved to New Hampshire when he was 2 years old and then lived here all his life. His eulogy began with, “He was not from around here…” Craig is an amazing artist. Check out some of his work; Click Here! The Lost River Gorge and Boulder Caves is located between Bath and North Woodstock on route 112. This steep walled glacial gorge is partially filled with immense blocks of granite. These jumbled boulders form cracks, which may eventually become Boulder or Talus Caves along the walls and bottom of the gorge. 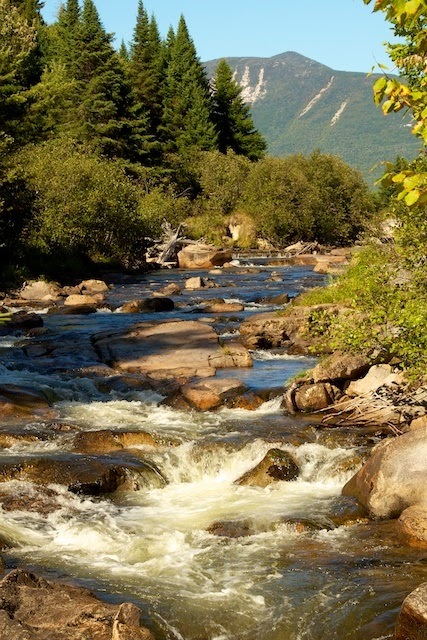 The river disappears under the rocks and reemerges cascading over and under until it finally emerges and joins the Pemigewasset River. The gorge is accessed via a boardwalk and some of the “caves” that allows us to follow the river as it appears and reappears. The caves would be fun if we were twelve years old or masochistic contortionists, but since we’re neither, we only venture into the ones with a larger than 2 ft. openings. The boardwalk is impressive and winds over and along the gorge. Without it a visit would consist of rock climbing 101. Searson: A Canadian band fronted by Sisters Erin and Colleen Searson deliver high energy a blend of Celtic, East Coast and Scottish fiddling, passionate vocals and toss in a bit of step dancing. 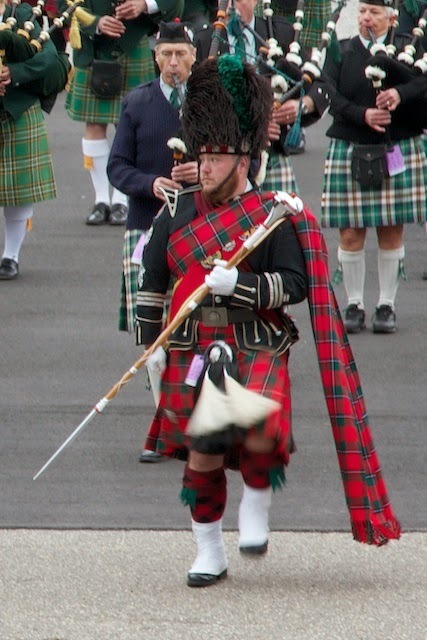 The Brigadoons: A Scottish band that plays a peppy brand of traditional Celtic music, with a few twists. Albannach: an exciting Scottish tribal drumming band that blew us away. 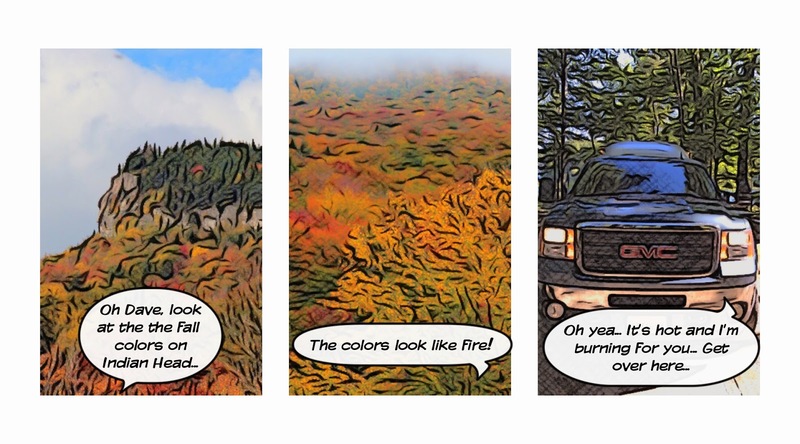 Don’t let the title scare you… those are just the pigments that decorate the autumn foliage… and since New England is the fall foliage capital of the world… what better place to hang and watch the colors change than the White Mountains in New Hampshire? 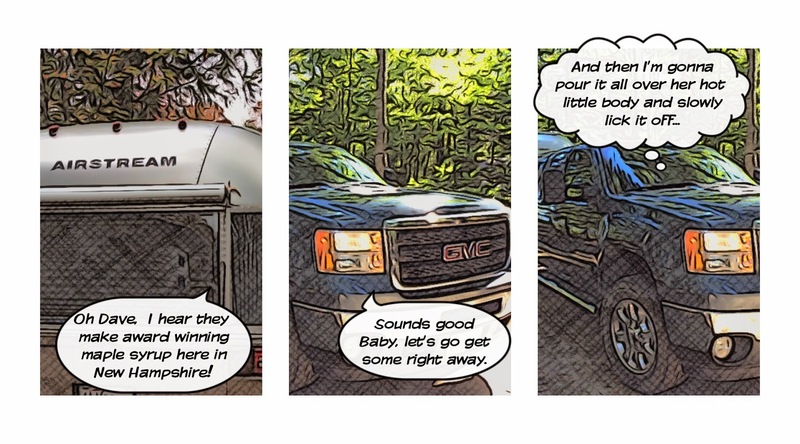 We check into the Country Bumpkins Campground along the Pemigewasset River. This is a small, family run park with cabins, camping and a few full hook-up RV sites. Folks come here year after year and it’s sometimes tough to get a space. Luckily, they are in the process of adding a few more full hook-up sites and one is ready the day we check in. The only caveats: no WIFI in this area (but we can get service by the office) and they are working on spot next to us (which is no problem as we are usually gone during the day.) The entire park is decorated for fall with cute scarecrows, corn stalks and pumpkins and some of the leaves on the trees are starting to turn. This is a great base camp to explore the region. 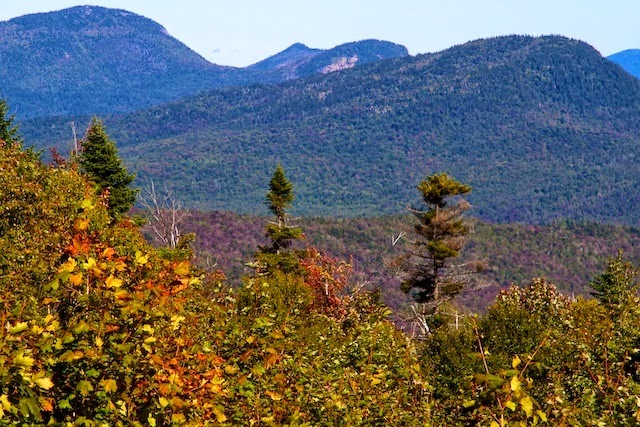 We are just down the road from Franconia Notch State Park with its miles of hiking trails, nearby national forests for more hiking and leaf peeping. 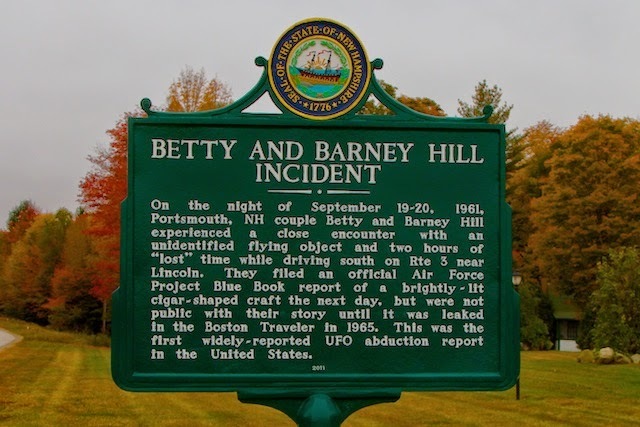 Plus an added bonus… this is the stretch of Highway 3 where on September 19, 1961, Barney and Betty Hill met up with some extraterrestrials – the first widely publicized case of UFO abductions. A State Historic Marker commemorates where the event occurred along Highway 3. We head into the nearby town of North Woodstock to visit Fadden’s General Store and Maple Sugar House. 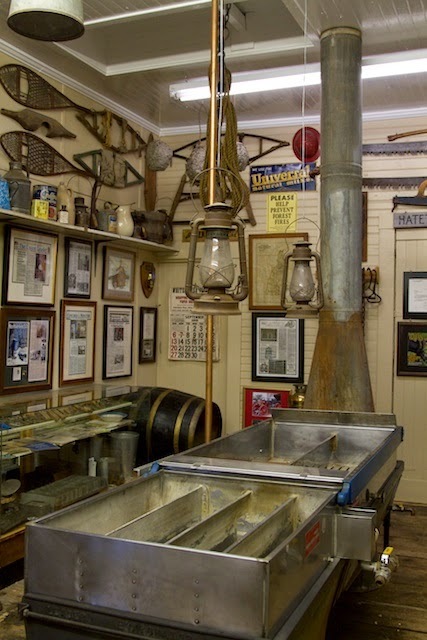 This classic New Hampshire country store has a small sugar house museum and also sells the Fadden family’s award winning maple syrup (six Carlisle Trophies for the best maple syrup in New Hampshire and a Governors Cup for the best in North America.) We pick up a couple of pints of syrup and a jar of maple cream. Maple cream is a decadent concoction where syrup is cooked and then whipped into a smooth spread and it’s outrageously delicious… think: thick, creamy, concentrated maple syrup! Down the street from Fadden’s is the Woodstock Inn Stationand Brewery. We see a sign offering tours so we pay our $5 tour fee and sign up. The fee covers a commemorative pint glass and a six flight tasting and, of course, the tour. We are the only ones to show up today so we get a private tour. We start in the Brew Pub where we learn the history of the brewery and then head to the other end of the Inn to the brewery. 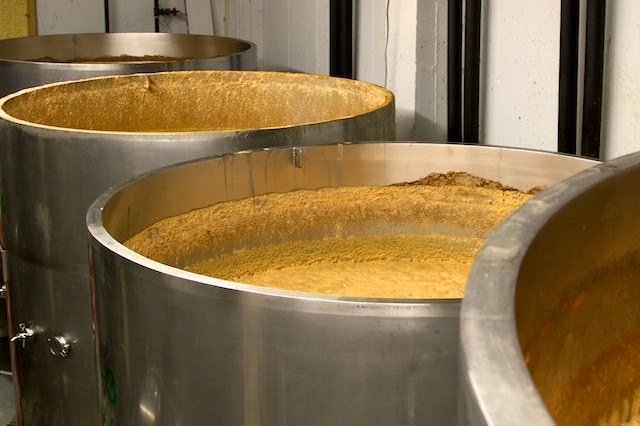 They do things a little differently here, using open fermentation vessels. During the tour we actually get to climb a ladder and look into the vessels. After the tour we head back to the Pub for some serious tasting and end up staying for lunch. The Brews are good. Their Autumn Brew with an apple and cinnamon flavor is especially nice with a shot of Fireball Whiskey. The Lobster Egg Rolls are divine! Sweet chunks of fresh tender lobster rolled with a creamy filling… my mouth waters just thinking about them! We also get an order of their Spicy Mac and Cheese with sliced London broil and an order of their fish and chips. The food is all pretty outstanding but the Lobster Egg Rolls are exceptional! Since we are sitting at the bar, service is excellent! Oh yeah the Lobster Egg Rolls are marvelous! 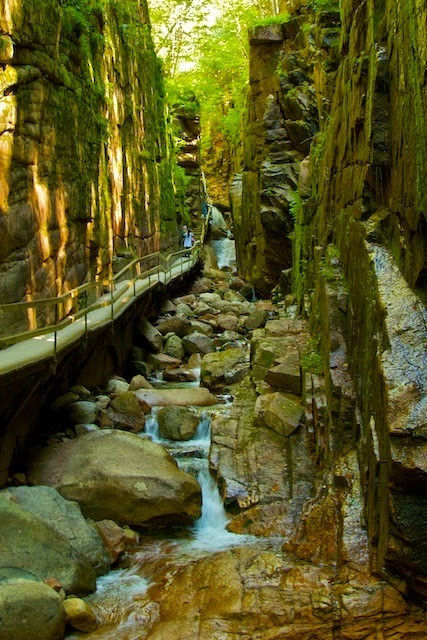 The Flume Gorge is one of the most frequently visited scenic attractions in the White Mountains. A flume is formed when natural forces, usually water, erode a softer rock that has filled a crack in harder rock. 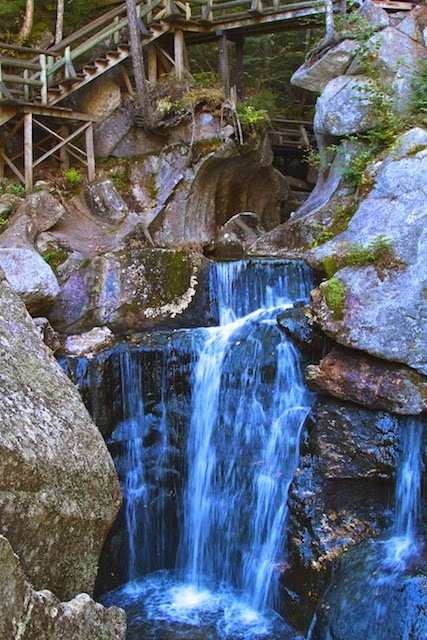 This flume is in the Conway granite and is considered one of the finest examples of a flume gorge. There is a $15 per person entrance fee, which seems exorbitant at first and well worth it after we actually enter the gorge. Before entering the gorge we pass by the Flume Covered Bridge, one of the oldest covered bridges in the state. There is a walkway bolted to the wall of the gorge and a series of bridges that take us back and forth over the rushing water. We pass several waterfalls starting with Table Rock, an unnamed falls half way up and end at the Avalanche Falls. 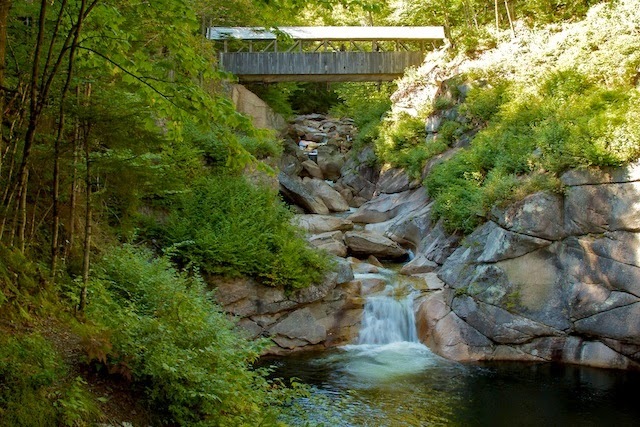 We continue our two-mile loop and pass the Liberty Falls and cross a covered footbridge over the Pemigewasset River as it cascades into The Pool. The surrounding forest are filled with glacial erratics (huge boulders pushed by glaciers over 25,000 years ago.) Many of these erratics have huge trees growing on top of them with roots reaching around the boulders and into the ground. The estimated time to walk the two-mile loop is an hour and fifteen minutes… but we stretched that out to about three hours of gorge gawking. 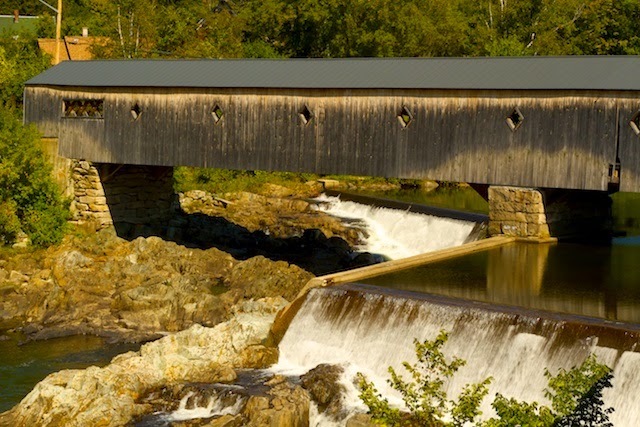 New Hampshire is famous for spectacular scenery, covered bridges, stellar fall foliage and TAX FREE SHOPPING! So… when we wake up to pouring rain and a forecast for more of the same all day… it’s time to head to the nearest outlet center and do a little retail therapy. It is a very successful foraging day! 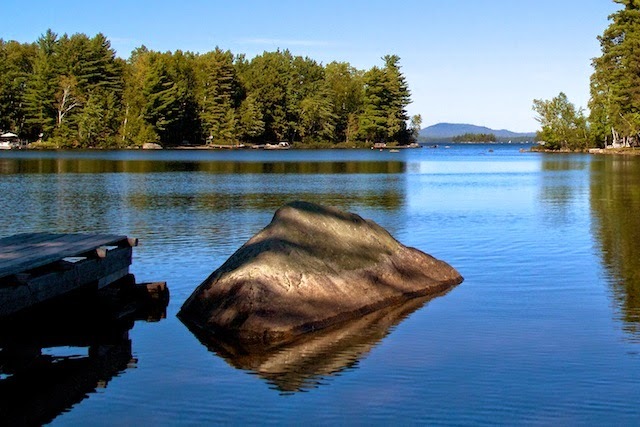 Since we’ve pretty much explored everything along the coast we might as well head inland to our previously planned destination before Dave got sick… We start out early morning headed towards Baxter State Park, the home of Mt. Katahdin the northern terminus of the Appalachian Trail. Just past Bangor we get onto Hwy 95… speed limit 75mph… after some miles the error messages clear… Dave starts to run better… then… a regen… and… no new error messages… WOO HOO… is this all Dave really needed, a hard and fast blow out of his emissions control system with clean fuel??? Hope springs eternal! We stop at Katahdin Air to see if we might still be able to fly over Katahdin in the next week… Sure… but it’s still dependent on weather… Encouraged, we walk across the road to the Big Moose Inn Cabins and Campground on the shore of Lake Millinocket (We made a 3 night reservation over a month ago, before Dave got sick… and we moved it forward a bunch of times and finally cancelled because we were pretty sure that we would not be able to get there… they have a 30-day cancellation policy and at this point we are out $93 for the three days that we previously booked and cancelled.) Katie at the lodge remembers us. “You finally made it!” she says when we introduce ourselves. She then reactivates and moves our reservation to the next week… Guess it’s back to plan A! After the weekend we take Dave back to the dealer. They run the diagnostics and there are no error messages… So the next morning we pack up and head out to the Big Moose Inn and Baxter State Park. The Big Moose Inn has a total of 4 water and electric RV sites. Since they are all empty we have our pick. We choose one at the back that seems to meet all of our basic requirements. The site looks incredibly lumpy but once we pull in and park, it is totally level. Early the next morning we are awakened with loud bangs and thumps…seems our spot is below a number of pine trees and at this time of year, they are dropping super sap laden pinecones… thump… sticky sap… thump… maybe we need to rethink this… So we move to the site next door without the sappy pinecone bombs! We’re only here for a couple of days to get close to the northern terminus of the AT. We have already decided that climbing Mt. 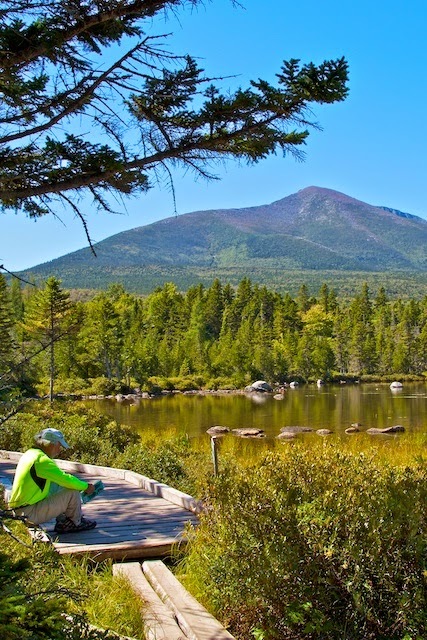 Katahdin is NOT in our immediate or any future, but we are willing and able to hike and explore the area leading up to Katahdin. At the visitor center we chat with the ranger and indicate that we are interested in some moderate hikes. 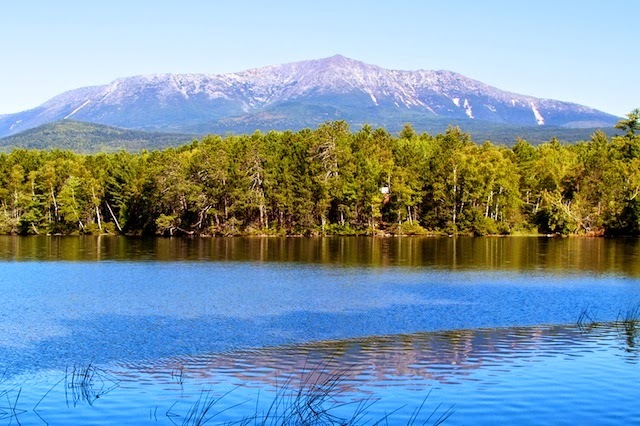 We get a map and some hiking recommendations and take a few photos of Katahdin from behind the visitor center. Baxter State Park is for hiking and camping, with limited vehicle access, (Dimples is too long and wide to be allowed in the park) no services and unreliable cell coverage. There is a paved road into the park to a tollbooth. Here we pay our $14.00 out of state visitor fee for a full day’s use of the park and are given a pass. Just past the tollbooth the road splits and is no longer paved. We take the east fork for about eight miles to the end at the Roaring Brook Campground. From here we hike to Sandy Stream Pond. The path takes us through forest and over wetlands and along the shore of Sandy Stream Pond with great views of the eastern side of the mountains. We stop at the Big Rock viewpoint; an aptly named big rock along the shore and a great place to sit and watch for moose. No moose today, just a couple of ducks out on the pond. Next we drive back around to the west fork of the park road to Daicey Pond. 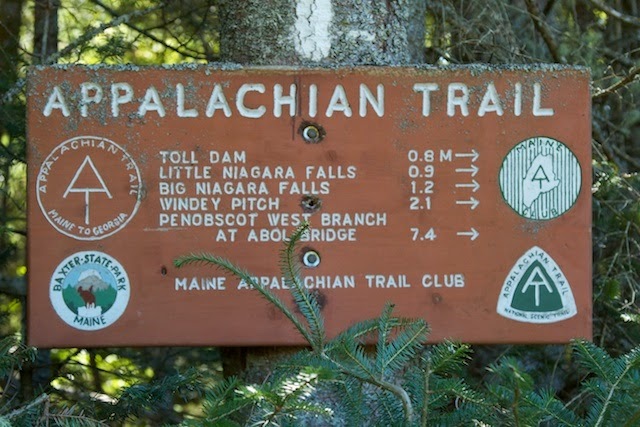 Here we hike along the Appalachian Trail to little and big Niagara Falls. Both sets of falls are pretty impressive, but there is no access to the bottoms of either falls, so photos are tough. At Little Niagara there are large stones that extend out at the top of the falls. It’s a bit of a scramble to get out there, but the view up the Nesowadnehunk Stream to Mt. Katahdin is worth it. On our second day here it rains all day, so we hang out in the lodge using their WIFI until the power goes out. So we go back to Dimples. When the power comes back on we head back over to the lodge to use the WIFI for a bit before having dinner. While there, the chef brings out a new roasted beet salad creation for the Inn manager to taste. We can’t ignore the ohhs and ahhs. We’ve heard that the food is good here and now we are really looking forward to dinner. There are two dining options, Fredricka’s for an intimate dining experience and The Loose Moose Bar and Grille for a more social experience. Both restaurants offer menus created by executive chef Matteo Proctor and diners can order off either menu regardless where they are dining. We opt to dine in the Grille. After perusing the menus we ask about the beet salad. It’s tomorrows special, but the chef will prepare it for us tonight. We also order a fresh Maine crab cake with roasted corn succotash and spicy sriracha aioli and haddock stew and fresh focaccia bread. The beet salad is amazing, the haddock stew creamy and full of flavor and the fresh focaccia light and savory. The crab cake tasted less than fresh and a bit blackened but the corn and aioli were excellent. They also have a good selection of local beers on tap and a full bar.